Although advanced surgical operation and chemotherapy have been under taken, pancreatic cancer remains one of the most aggressive and fatal human malignancies with a low 5-year survival rate of less than 5 %. Therefore, novel therapeutic strategies for prevention and remedy are urgently needed in pancreatic cancer. This present research aimed to investigate the anti-cancer effects of hyperoside in human pancreatic cancer cells. 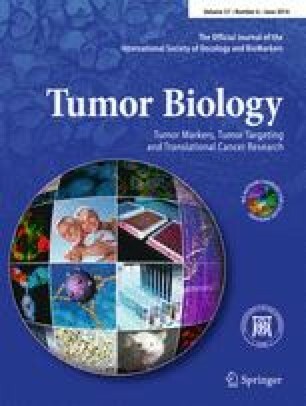 Our in vitro results showed that hyperoside suppressed the proliferation and promoted apoptosis of two different human pancreatic cancer cell lines, which correlated with up-regulation of the ratios of Bax/Bcl-2 and Bcl-xL and down-regulation of levels of nuclear factor-κB (NF-κB) and NF-κB’s downstream gene products. What’s more, using an orthotopic model of human pancreatic cancer, we found that hyperoside also inhibited the tumor growth significantly. Mechanically, these outcomes could also be associated with the up-regulation of the ratios of Bax/Bcl-2 and Bcl-xL and down-regulation of levels of NF-κB and NF-κB’s downstream gene products. Collectively, our experiments indicate that hyperoside may be a promising candidate agent for the treatment of pancreatic cancer. This work was supported by the National Nature Scientific Foundation of China (No. 81372613, 81170431, 81302057), The National High Technology Research and Development Program of China (No. 2014AA020609), and Youth Science Foundation of Heilongjiang Province (No. QC2012C042).